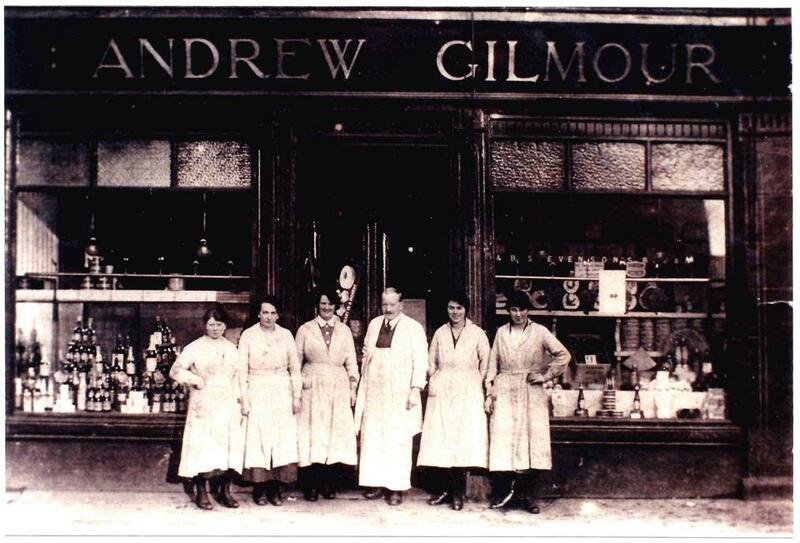 Pictured here in 1919 is Andrew Gilmours shop, Glasgow Road. The shop was on Glasgow Road almost opposite the end of Merry’s Rows. From the left is Elizabeth Neil, Lizzie Jamieson, Agnes Dunsmore, Tam Naismith (Manager), Mary Shanks and Agnes Kirkland. The photo belongs to Gordon Dunsmuir and is reprinted here with his permission. The names follow from his mother’s recollection. 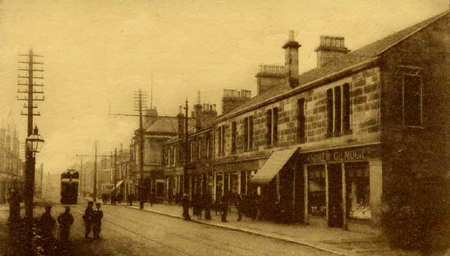 Richardsons butchers shop was not in Gilmours Buildings, but was located at the corner of Forrest Street on Glasgow Road, with the Livingstonian Bar on the opposite corner of Forrest Street Entrance. Pictured below in the earlier 1910’s era, you can see Andrew’s old grocer shop just as a passing tram enters the scene.